Throughout much of the sedimentary rock layers of the Great Artesian Basin of Australia lie significant quantities of opal. In fact, it's said Australia supplies between 92 and 94 percent of the world’s opal, though this is possibly an overstatement, as there are many other countries with opal deposits. Most of the opal fields in Australia are great camper trailer destinations, and the frontier nature of many of these settlements makes them endlessly fascinating for the curious traveller. Opal is a form of hydrated silica. That means it contains a considerable amount (3 to 21 per cent) of water, and it's for this reason why many dealers store their opals in water, to prevent them drying out. The silica was deposited by water in small cracks and fissures in the base rock (in Australia usually a sandstone), and the water assists in the diffraction of light, producing the rainbow colour effects that make it so attractive for jewellery makers. South Australia produces the greatest quantity of opal in Australia, mostly from the Coober Pedy region, with additional production coming from Andamooka and Mintabie—both just extensions of the same deposits. 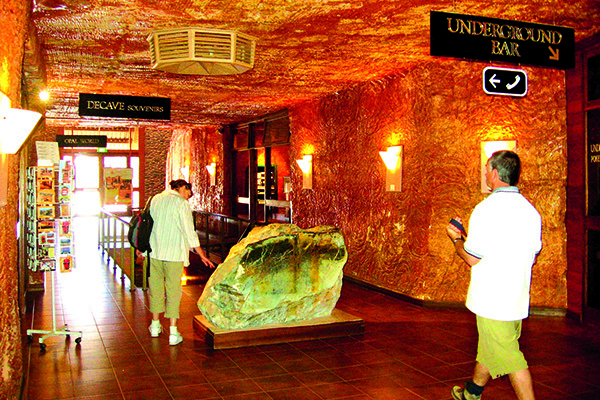 Coober Pedy is off the Stuart Highway, so is very accessible, and offers some great tourist activities; ranging from mine tours, the underground motel and shopping centre, to tours of miner's underground homes. 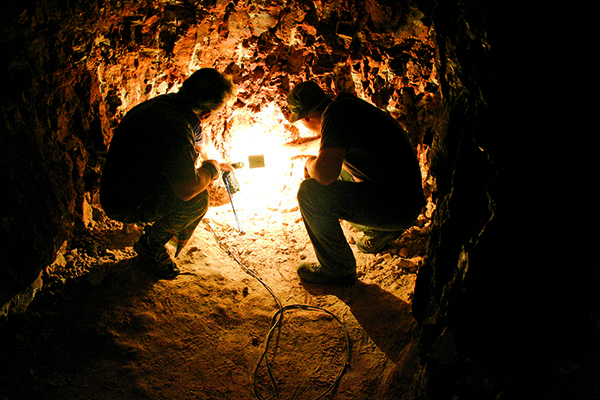 Most opal mining towns are located in hot, arid climates, so miners frequently build their dwellings underground, with only snorkel-like air vents indicating where they are. The diggers often discover enough opal in such digging to pay for the construction of their homes, which remain cool and quiet throughout the year. 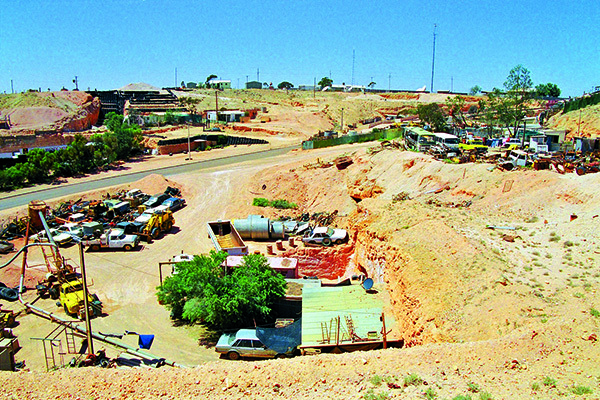 Coober Pedy only brought in town planning to cover the digging of such homes and their extensions a little over a decade ago, as diggers would often unknowingly dig a hole right into their neighbour’s abode. 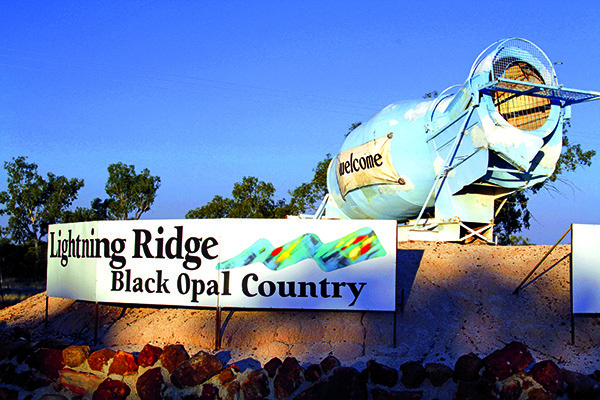 In far northern NSW, the town of Lightning Ridge is the major centre for the most valuable form of opal: black opal. As the name suggests, the black background of this gem highlights the colour to such an extent that it is worth much more than the more common white opal. How many people live here? Who would know, as census responses vary widely, and the secretive nature and transience of many of the miners leads to widely varying numbers. The local Walgett Shire Council works on the basis of there being 7000 residents, but only a little over a thousand people have their name on the electoral roll. Most opals are actually fossils, or the remains of what were once fossils. 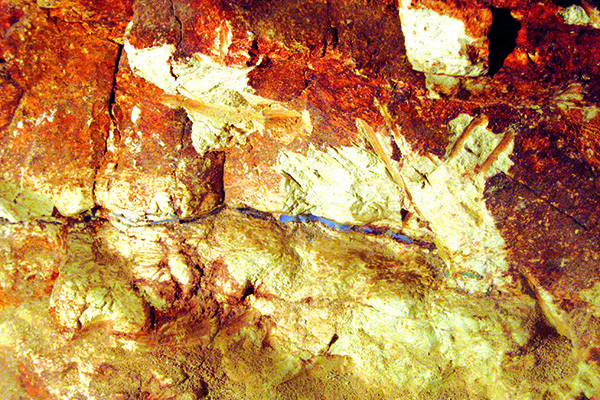 The original shell or bone material has been dissolved and the hydrated silica has replaced it within the ground rock. Many famous fossil specimens have been found by opal miners, including complete plesiosaurs, pieces of other dinosaurs and other creatures whose remains settled on the bottom the ocean, in what was once a shallow inland sea, over 100-million years ago. The flat nature of the sedimentary rocks—which results in the largely flat interior of South Australia, north and western NSW and southern and western Queensland—means that miners need to dig and tunnel down into the ground to find the deposits of opal. 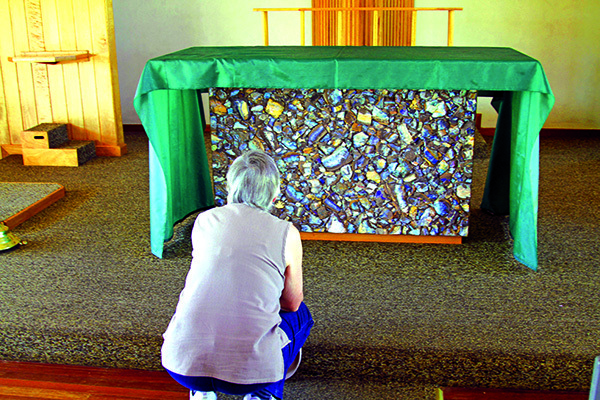 The rock is removed to above ground screening stations, where it is broken up and the opal extracted. This results in the typical appearance of opal mining areas with numerous piles of 'mullock heaps'— the discarded rock from the underground mines. Digging through old mullock heaps will often reward fossickers with small pieces of opal, which have been missed by the original miners. Historically opal was believed to bring good luck and was thought to possess the virtues of all other gems which matched the colours visible in the stone. However, when Sir Walter Scott published Anne of Geierstein in 1829, one of the main characters wears an opal with special powers. When a drop of holy water falls on the stone it suddenly becomes colourless and the character dies soon after. Such was the popularity of the book that opals became associated with bad luck, and sales of the stones in Europe fell by 50 percent. Even at the beginning of the 20th Century Russians believed that an opal was believed to embody an evil eye. Opal is the birthstone of those born in October.